It was magnificent from Mo. Simply and utterly magnificent from Mohamed Salah as for the second Premier League game in a row he scored a quite outstanding goal to help return Liverpool to the top of the table. As the storm of celebration raged around him, after his thunderous shot hit the net, Salah struck a singular celebration. 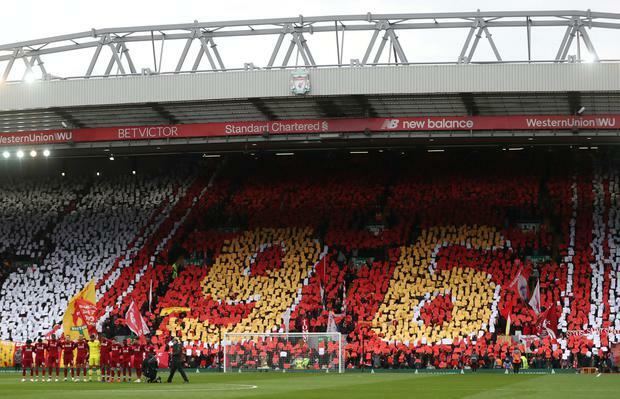 He stood on one leg, his left leg crooked in the air against his right knee and put his hands together in prayer in front of the Kop. It looked like a yoga pose, a moment of Zen-like, serene calm as Fabinho and Jordan Henderson roared their approval behind him. Maybe it was also the perfect riposte to the discriminatory abuse directed at the Egyptian by a small number of Chelsea supporters in midweek which the club had condemned and which Jurgen Klopp had called "disgusting". Salah's 22nd of the season was a goal of the ages, one to cherish, one to play again and again to shut up those bigots and racists and show what a player he is, someone they could never be. In defeating Chelsea for the first time here since 2012, there was also a collective sense of catharsis, exorcising the trauma of Steven Gerrard's slip five years ago that cost Liverpool the last time they were this close to being champions. They even won by the same scoreline. Salah was in Chelsea blue that day, a peripheral player in Jose Mourinho's second string, who lasted an hour before being substituted for Willian, who then scored the late second goal to break Liverpool hearts. But no one doubts Salah's status now at Liverpool, where he is one of the very best forwards in world football and struck what Klopp rightly labelled a "world-class" goal. "It blew me away," he added. "A thunderbolt." Worthy of winning any game, for sure. 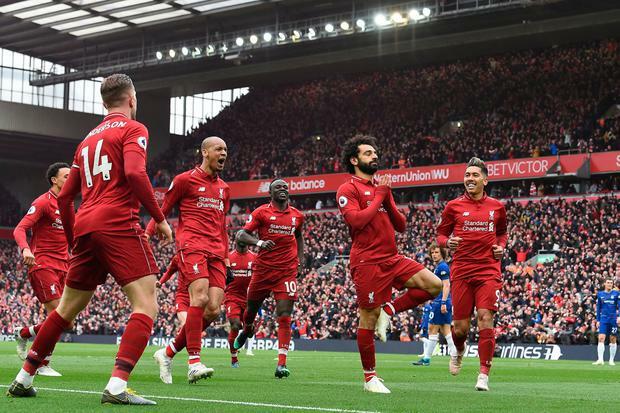 It doubled Liverpool's advantage and came in two minutes of madness - followed by two more minutes of madness when Chelsea could, and should, amazingly have drawn level as maybe those old Liverpool nerves temporarily returned. But the stakes are so high. "They could have changed the game completely," Klopp conceded in his 200th match as Liverpool manager. However, they did not and Liverpool were worthy winners. They needed to be. They kicked off within minutes of Manchester City beating Crystal Palace away to go back above them. When Palace had scored in that game the cheers of hope, rather than expectation, could be heard ringing around the Anfield concourses. But now Liverpool are back two points ahead having played a game more. It is not in their hands but they have negotiated arguably their most difficult remaining fixture while City have to face Tottenham Hotspur and Manchester United. No one can call this. Liverpool, therefore, are doing what they have to do, as Klopp also declared, and could end up with 97 points - and finish second. In fact, with four games to go Liverpool already have 85 points, which is just one fewer than City gained to beat them to the title in 2014. And so they go again. 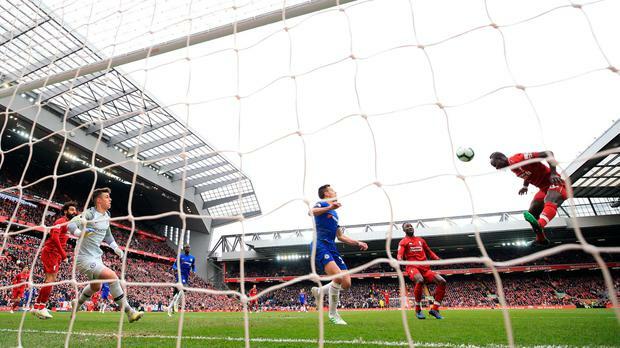 After a tense, tight first-half which remained goalless, Liverpool tore into Chelsea. They went ahead when the excellent Fabinho played the ball into Salah, with Jordan Henderson taking over possession inside the opposition penalty area before chipping a cross to the far post where it was met by Sadio Mane, who headed the ball past Kepa Arrizabalaga for his 21st goal of the campaign. As Anfield erupted and continued to celebrate Liverpool scored again. After his wonderful solo effort away to Southampton nine days ago here was another by Salah as Virgil van Dijk played the ball out to him on the right wing. Salah cut inside, away from Emerson, and towards the angle of the area before driving a powerful left-foot shot from 25 yards that swerved away from Arrizabalaga and tore into the net. Chelsea twice quickly spurned clear chances to equalise with Eden Hazard - of all people - the guilty party on both occasions. The Belgian had started through the middle but, after Salah's goal, Chelsea head coach Maurizio Sarri brought on Gonzalo Higuain and restored Hazard to the left, which he prefers. It was from there that he ghosted in to meet David Luiz's ball over the top, take control and then shoot low to beat Alisson only for his effort to cannon back off a post. Then, soon after, he met Willian's cutback and, clear on goal, his shot was smartly saved by the Liverpool goalkeeper. There were further opportunities with, in particular, Arrizabalaga doing well to push away a fierce, rising drive from Mane. 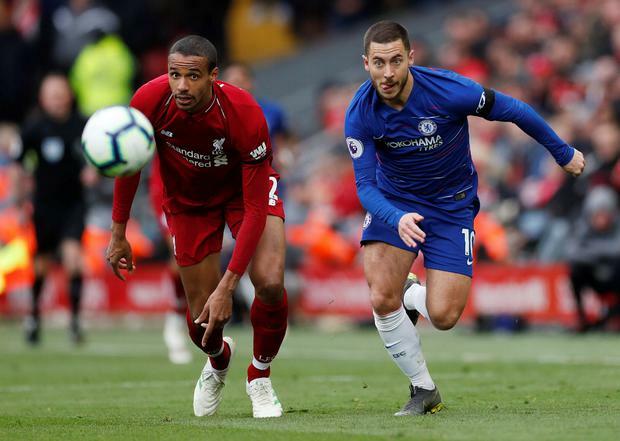 The game was fast and loose and ebbed from end to end, a far cry from the tense first-half in which Liverpool pressed but were almost undone by Chelsea on the break. Hazard played cleverly, Willian joined him and Ruben Loftus-Cheek showed flashes of skill although the clearest chance fell to Salah early on, but he volleyed weakly at the Chelsea goalkeeper. The defeat was a blow to Chelsea's top-four hopes, and a seventh in the Premier League away from home this season. Maybe the most significant moment of the opening period for them was the loss of their best defender, Antonio Rudiger, to injury with Andreas Christensen appearing nervously as his replacement. 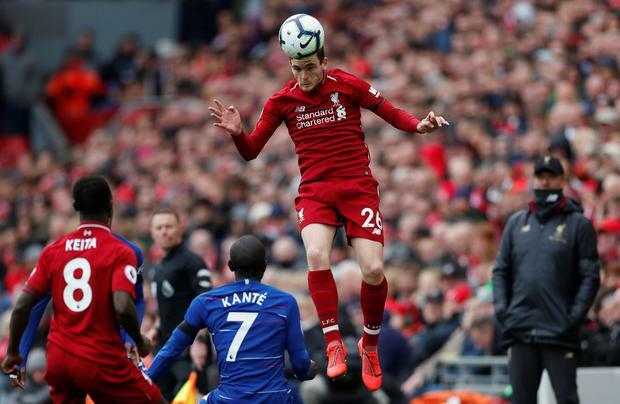 Liverpool preyed on that also, with Roberto Firmino, in particular, showing a shrewd awareness to attack Christensen as manager Klopp received the intense response he demanded. At the end of the 90 minutes he approached the Kop, fist pumping three times in celebration.